Yesterday was an odd late April day with snow flurries and a morning frost. The temperatures warmed up enough that the snow didn’t stick and people still fished. Streamers seemed to be the best producer followed by nymphs. A few fish were landed despite the weather. Today looks a little nicer with air temps predicted to peak in the 40’s and they should continue to climb over the next few days. Winds will be blowing in the teens today so find the protected bends or side channels for protection. The releases are still low due to the current flow plan. One benefit of that is lower water for wading and nymphing as you move upstream and get above some of the feeder streams. Cannonsville reservoir is at 99.2% capacity with an inflow at Walton of 1,040 cfs. The West Branch under the 191 Bridge peaked at 44 degrees yesterday and is starting off at 40 degrees this morning. 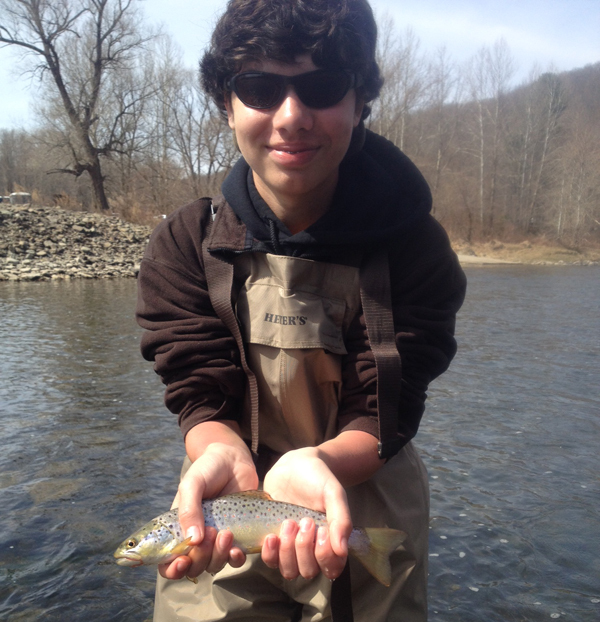 Peter found some success on the West Branch last weekend. He’s going to be a great fisherman!